Ali Fontaine is an Anishinaabe (Ojibwe) singer/songwriter from Sagkeeng First Nation, Manitoba, Canada. 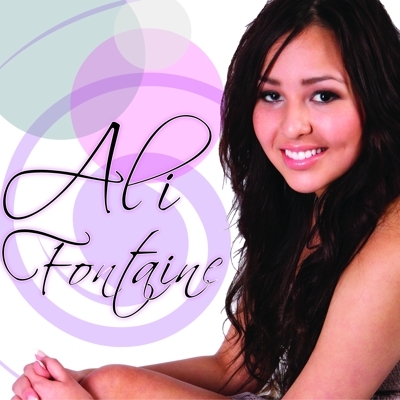 Before young Ali Fontaine finished her senior high school year, she had already produced a debut full length self-titled album of award winning, top charted original hit songs. Ali’s debut self-titled album is “one solid record that displays a maturity that belies her 17 years. Her voice and songwriting come off as effortless, showing a poise that will have veteran performers envious and audiences swooning” (Manitoba SCENE). It was no surprise that Ali received 'Most Outstanding Manitoban', 'Best New Artist' and 'Best Country CD' at the 2011 Aboriginal Peoples Choice Music Awards. Her initial success served as no distraction to her musical drive as young Ali released an anticipated second album titled “Diamond in the Rough”, June 2012 earning her the Aboriginal People's Choice Music Award for 'Female Entertainer of the Year' and Native American Music Award for 'Best Country Album' in 2013. In 2015, Ali released the single 'Free' which reached #1 on the National Indigenous Music Countdown. Her newest single "On & On" (2017) is now available to stream and purchase on all major online music distributors including iTunes, Apple Music, Spotify, and Google Play. A departure from my previous sound, “On & On” (2017) is an R&B/Pop experimental track created in collaboration with producer (and hubby) Shane Keepness. Written by Ali Fontaine. A pop song with country flavour, "Free" (2015) is an upbeat and youthful medley with lyrics that speak about living care-free and encourages listeners to free themselves from the control and dictation of capitalism. Produced by the award-winning Murray Pulver. Written by Ali Fontaine. Released Ali's high-school senior year (2012), "Diamond in the Rough" is pure country with lyrics that speak of adolescence, teenage love and heartbreak, rez life & rural Manitoba living. "Diamond in the Rough" features songs such as "Fight for You" and "Ignorance," both songs reached #1 on the National Aboriginal Music Countdown. Produced by Tom Dutiaume and Errol Ranville. All songs written by Ali Fontaine. Released when 16 years old, Fontaine's debut album "Ali Fontaine" (2011) is described as being “one solid record that displays a maturity that belies her 17 years. Her voice and songwriting come off as effortless, showing a poise that will have veteran performers envious and audiences swooning” (Manitoba SCENE). "Ali Fontaine" was awarded Best Country CD at the 2011 Indigenous Music Awards (formerly Aboriginal Peoples Choice Music Awards). Produced by Marc Arnould and Errol Ranville. All songs written by Ali Fontaine except "Run As One".